A mid-19th Century engraving of the interior of St Mary's, looking west from the Sanctuary. The central part gives a glimpse of the pews in the central part of the nave, and the singer's gallery, probably as they were before the 1846 replacement with the bench pews still in place today. Mr Herbert Daybell has allowed us to print the following discussion and extracts of a document he came across in his archives “while looking for something else”. The congregation and Friends of St Mary’s will be well aware of the refurbishment of the west end of the nave that took place recently, and that work required the removal of the rear rows of pews. A variety of opinions was expressed about this at the time. This report shows us that similar discussions have been held in the past, when the decision was taken to alter the accustomed appearance of the church. 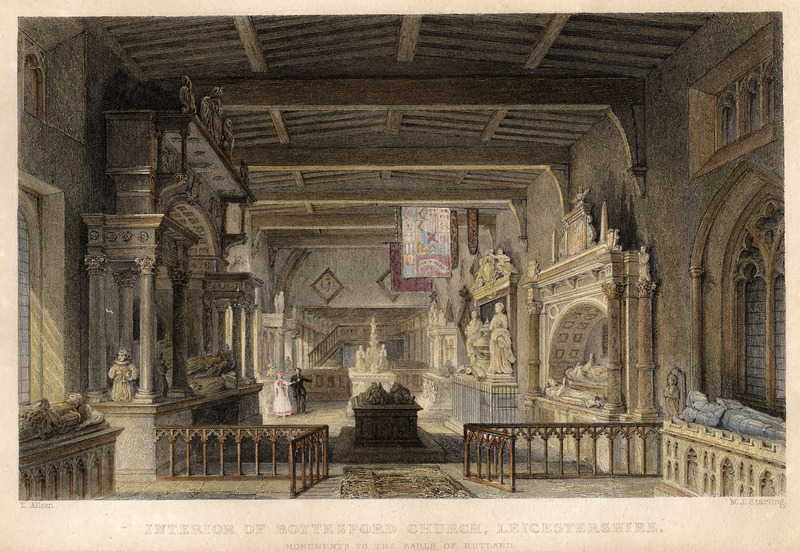 “It is the earnest desire of the rector and several inhabitants, to have the church put into a proper state of repair, so as to enable the congregation to attend public worship with decency and comfort, whish at present they cannot do”. It goes on to say that the seats then in the church were installed about 1700. Using language of the day it says, “a few of the seats then put down have been perverted into most awkward square and oblong pews, which has tended to lessen the accommodation and to mar the appearance of the church”. The seating arrangements in 1846 are listed as being 498 in total, less 120 places for Sunday School Children and 30 for what is described as the Singers Gallery. “The seats at present in the church are many of them in a most decayed and dilapidated state – particularly all those in the aisles, transepts west of the nave and those belonging to the Men’s Hospital. The seats in the body of the nave are in somewhat better repair, though they are most uncomfortable and clumsily put together”. This tale of woe continued with comments on the flooring which was “very uneven and much in need of repair”. The stonework of the windows of the clerestory was “wholly gone” and some of the others were “near falling”. Several of the pinnacles along the parapet of the nave were “only kept from falling and leaking through the roof by irons, which are nearly rusted to the core”. Architects Messrs Sharpe and Paley of Lancaster were called in and, for that time the hefty sum needed to address these issues was assessed as costing £1225. Things had clearly got to such a perilous state that something had to be done. So, at the Vestry Meeting on 6th November, 1846, it was decided to set about raising funds for the project. They called for… “The assistance of friends of church extension is earnestly requested for the purpose of reseating with oak open pews and of putting into thorough repair the above named building, which for exquisite symmetry and beauty has been pronounced by persons of the best taste and judgement to be one of the finest specimens of its character and style in the kingdom”. They also agreed that “a rate of 10 pence in the pound be granted towards defraying the expense of the proposed alterations and repairs….. And if more money was needed…. A further 5 pence also be granted… the amount to be borrowed by the churchwardens (Francis Orton and Francis Vincent) on security of the church rates”. Subscriptions from individuals were also called for and the Duke kicked the fund off with £100, and the reverend Norman with £200. The committee’s appeal for funds was addressed to “the many pious admirers of such holy adornments of our land”. Subscriptions were to be made to Messrs Hardy and Co, Bankers of Grantham.